What's safe for babies? Not formaldehyde, which is known to cause cancer in humans. And yet, a new report alleges that formaldehyde is present in more than half of a line of cleaning products that's promoted as being safe for babies. BabyGanics describes its products as “so safe that you can even drink them” and in a video posted online, a company spokesman drinks from a bottle of a BabyGanics cleaner. The Environmental Working Group (EWG) says the stunt is "a dramatic illustration of why it is essential that makers of cleaning products fully disclose their ingredients on product labels." 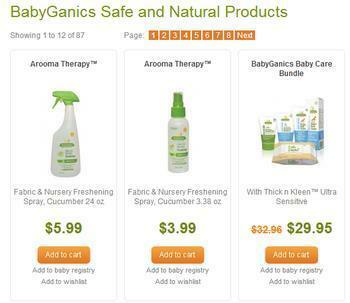 The BabyGanics line is sold by national retailers such as Babies R Us and Bed, Bath & Beyond. After the company contacted EWG and protested its grades, it agreed to post a full ingredient list on its website. This list, in turn, revealed that more than half of its products contain a preservative called HHT (Hexahydro-1,3,5-tris(2-hydroxyethyl)-s-triazine), which releases formaldehyde during product use. As a result, those products will continue to be graded “F” on the EWG guide until their formulations are changed. "Further, no BabyGanics product manufactured today contains HHT, and HHT has never been used in any of the 30 plus BabyGanics personal care products," BabyGanics said. The company said that, although "scientific evidence shows the ingredient is perfectly safe as it was used, BabyGanics had already moved before EWG’s comments to replace the preservative containing HHT in our surface-cleaning products." The company said it replaced it with "an equally efficacious and safe preservative that may be more attractive to consumers." The BabyGanics revelation is a dramatic reminder that consumers cannot take companies’ labeling and marketing claims at face value. “As a mother of two young children, I am shocked that companies don’t have to tell consumers what’s in their cleaning products,” said Heather White, EWG’s chief of staff and general counsel. “So many families buy these products because they think they are safe, when in fact they contain chemicals that could pose serious dangers, including cancer. EWG’s guide has highlighted how many cleaning products contain toxic chemicals and how difficult it is for even careful consumers to find out exactly what’s in them. Many companies use generic names like “surfactants” and “mineral salts” to describe some of their ingredients. Current federal law does not require disclosure of ingredients on the vast majority of cleaning products. EWG’s rating system and the information provided by the guide is challenging other companies to reevaluate what they put in their products and to detail that information on their product labels and on their web sites.